Anchor is a secure and reliable file synchronization software platform that allows end users to collaborate, synchronize content from multiple devices, and back up important files and folders. The server service can be provided by Anchor’s hosted cloud infrastructure (called the SaaS model) or it can be hosted within your internal infrastructure (called the private cloud model). Organization administrators can be appointed to help manage the server service. The client is used by end users and is deployed to a multitude of endpoints, including desktops, laptops, servers, and mobile devices. End users access their files, folders, and shares through the web portal, their desktop clients, and their mobile apps. The master organization—which is system generated—will display at the top-level of the hierarchy, and all other organizations that you create will sit below the master organization. 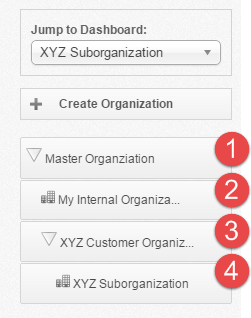 You can optionally create suborganizations, which will sit below the organizations that you create. A Customer’s Organization—you can create organizations for each of your customers. Optionally, you can assign organization administrators to specific organizations; these organization administrators will only have privileges to administer the organization to which they have been assigned. Best Practice: The master organization should remain empty; except for a few trusted administrators, users should not be given access to the master organization, and it should never be configured for internal or customer use. If you want to turn on Privacy Mode for one or two users (for example, a CEO), create a suborganization, add this user, and then turn on Privacy Mode at the suborganization level. For information about managing inherited policies, please reference the How to Manage Inherited Policies in Suborganizations Knowledge Base article. Within organizations, user accounts are created for end users who work inside an organization or suborganization. Guest accounts can be created for temporary users who have been invited to collaborate on, or view, a file, folder, or share. Guest accounts might be vendors, temporary employees, or consultants. A personal root, which contains data that is created when a user account is generated in the system. It holds all personal data for the user account. 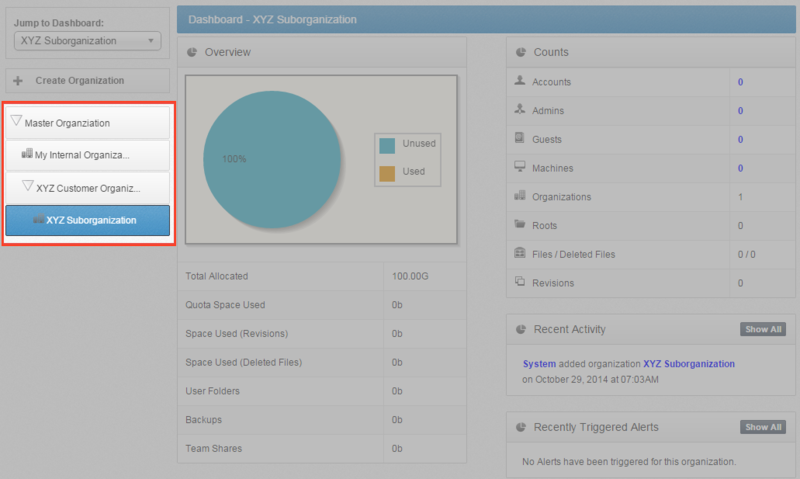 A Team Share root, which contains data that is shared with multiple user accounts. A backup root, which contains backed up data that can be restored in the event of data loss. Backup roots are not replicated to other machines. When allocating space quota settings, you should consider that Team Share roots only count towards the storage quota of an organization. Backup roots and personal roots, however, count towards both organization and individual user account storage quota. Organization administrators can use the Max File Size policy to control the size of files uploaded through the desktop client, mobile apps, and web uploads for users and guests. For more information, please reference the How to Create a New Organization section of the Anchor Administrator Guide. The system does not support the syncing of live databases. For more information, please reference the eFolder Knowledgebase. Desktop clients can be installed on both Windows and OS X machines. It should be noted that Anchor only supports 64-bit OS X machines. Best Practice: Desktop clients cannot be installed under a roaming profile. You can, however, configure a terminal server environment if necessary. For a complete listing of supported devices, please reference the System Requirements Knowledgebase article. With Anchor, your data is synchronized as efficiently as possible. When large, compressible files over 1MB are placed in the sync queue, Anchor utilizes an rsync-based syncing method that compares the existing revision with the updated revision, and will only transfer the changed portion. For example, if you edit one row of a large Excel spreadsheet, that change will be detected, and only that row will be synchronized. In this way, Anchor will never unnecessarily re-upload a file or waste bandwidth, resulting in efficient, quick, and safe file syncing.